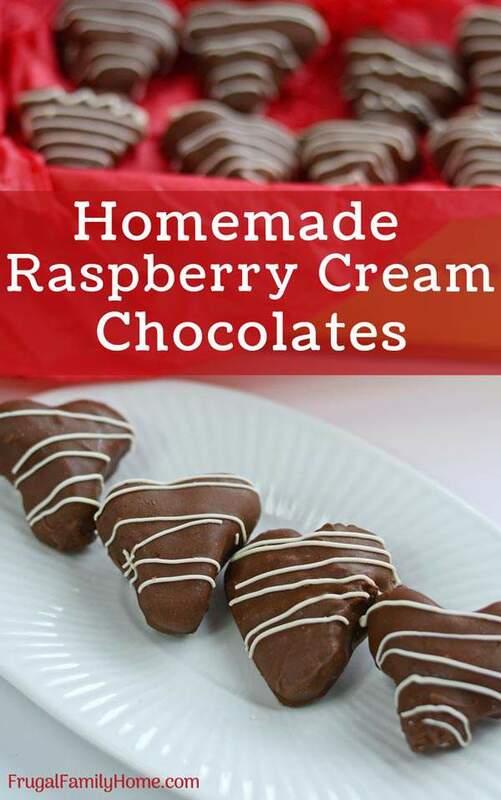 A recipe tutorial for how to make raspberry cream chocolates at home with easy to find ingredients. They are so yummy and delicious and use real raspberries too. Chocolates are the way to a girl’s heart, well at least this girl’s heart and a few other people I know too. If you want to make your own pretty and delicious homemade raspberry cream chocolates, this tutorial is for you. Candy making if you’ve never tried it can seem hard to do. But it really isn’t. Those yummy cream filled chocolates like the ones you get from the candy shops are really delicious and beautiful and can make you think you can’t make them at home. If you follow the steps and take your time, you too can make beautiful and delicious chocolates to enjoy yourself or to give as gifts at a fraction of the price too. At our local candy shop, the price of chocolate creams are $20 a pound. Yes, that’s right, $20 a pound. Seem so steep considering it’s milk, sugar, flavoring, and chocolate that goes into those beautiful little bites of yumminess. If chocolate is a passion of yours like mine, make your own chocolate raspberry creams at home and save a bundle of money. 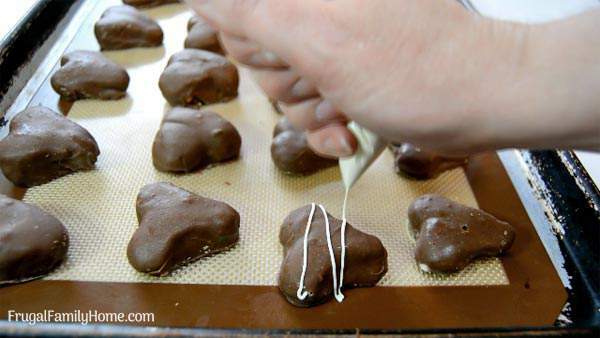 I’m showing you how to make raspberry cream chocolate hearts. They are great for Valentine’s day. But you can make the filling into balls and coat them in chocolate for other times of the year too. Some of the links below are my referral links. Which means when you purchase through them I can make a little money at no extra cost to you. Thanks for your support in this way. If you don’t have fresh or frozen raspberries, you can skip them and add a drop or two more of the raspberry flavoring and a little red food dye, if desired. I usually have raspberries in the freezer from our garden so I use them. If you do use fresh or frozen raspberries, you can remove the seed as I show in the video below, but if you don’t mind the seeds, you can just crush the berries and add them seeds and all. Do whichever works best for you. For you to see just how easy it is to make these yummy candies, I’ve made a quick video to show you the steps. If you’d rather read the directions keep on scrolling and grab the printable recipe below too. To make the raspberry puree, place the raspberries in a microwave-safe bowl and microwave about 30 seconds. Heating the fruit make the juices extract easier. Push the raspberries through a strainer to extract the juice and pulp, but leave behind the seeds if desired. Then set aside. Skip this step if you don’t mind the raspberry seeds in your candy filling. Now we’ll make the raspberry cream filling. You’ll want to combine the raspberry puree with the sweetened condensed milk, raspberry flavoring, and butter. Beat with a mixer to combine. The butter may still be lumpy and that’s all right. Add the powdered sugar a little at a time. I start with 2 cups and then add a half of a cup to 1 cup at a time. Eventually, the mixture will get too thick for your mixer to mix it. You want to keep adding powdered sugar until the mixture is no longer sticky and is a soft candy dough consistency. Once the candy dough is mixed and no longer sticky. Roll into balls or shape into hearts or other shapes and place on a lined cookie sheet. I show in the video above how to take two small balls of raspberry filling and shape them into a heart. This recipe made 30 medium sized heart candies with the dough. If you are making balls you will get more candies. Move the candy shapes on the sheet pan to the freezer and chill at least 30 minutes to overnight. If the candy is not well chilled, it can fall apart when dipping in the chocolate coating. I like to use chocolate drops for chocolate coating. It works well to coat the candy, tastes good and you don’t have to worry about tempering the chocolate so it doesn’t speckle. I get mine in the bulk foods at WinCo Foods but if you don’t have one near you, you can purchase them also at Michael’s in the store or online and at Amazon. I have links above in the ingredients section. Place the chocolate drops into a small saucepan and heat over low heat until all the chocolate melts and is smooth. Be sure to keep stirring so the chocolate doesn’t overheat and get grainy. Once the chocolate melts remove from the heat. Get the cream centers from the freezer and dip them one at a time into the chocolate. I will drop them in, then flip or roll the raspberry creams in the chocolate. Then lift them out with a fork and let the excess chocolate drip off. Place the dipped chocolate back on the cookie sheet and repeat for the rest. If the raspberry creams get too soft return to the freezer for to firm them up. I had to do this twice while I was dipping the ones I made. The chocolate back on the burner to warm it up if it cools down and gets too thick. Once all the raspberry creams are dipped in chocolate, you can place the cookie sheet back into the refrigerator to harden the chocolate quicker. You can also do let the chocolate harden at room temperature but it will take a little longer. Once the chocolate is firm, it’s time to decorate. This step is optional but dresses them up. In a small saucepan over low heat melt, the vanilla drops just like you melted the chocolate drops. Once they are melted and smooth. Scoop the vanilla chocolate into a zipper-topped bag and clip a corner. Drizzle the white chocolate out of the bag onto the hardened raspberry cream chocolates in a pattern you like. You can also drizzle the white chocolate with a spoon. But I find using the bag much easier to control the amount of chocolate drizzling down. While this process has a few steps, none of them are hard to do. 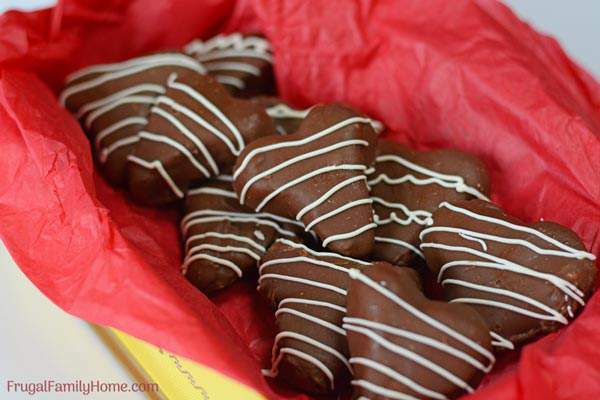 And you’ll have a delicious batch of raspberry cream chocolates to enjoy and to share with others. Grab the printable recipe below…. Place raspberries in a small microwave-safe bowl and microwave 1 minute. Crush berries to make the puree. If you want to remove the seeds, press the puree through a strainer. Set aside. In a medium-sized bowl combine the butter, condensed sweetened milk, raspberry puree, and raspberry flavoring. Beat with a mixer to mix well. There may be a few clumps of butter that are ok.
Add 2 cups of powdered sugar and beat until well combined. Add in a 1/2 cup at a time and keep beating until the mixture is no longer sticky and easy to handle. For the last cup or so you may have to add it by hand or with a spoon or knead it in by hand. The mixture will be too thick for the mixer. 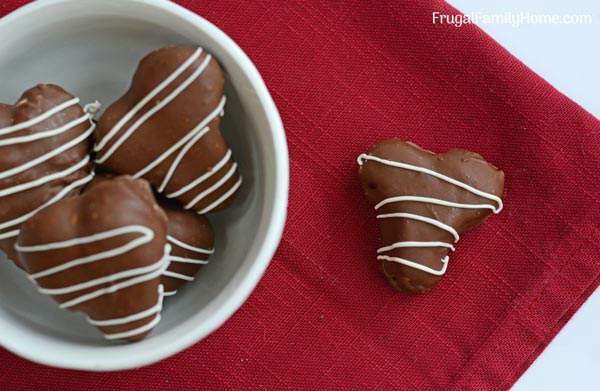 Shape the raspberry cream into heart shapes or balls and place on a lined sheet pan. Place in the freezer for an hour or overnight. After, the raspberry cream hearts are chilled. Place the chocolate into a saucepan and heat over low heat until melted and smooth. 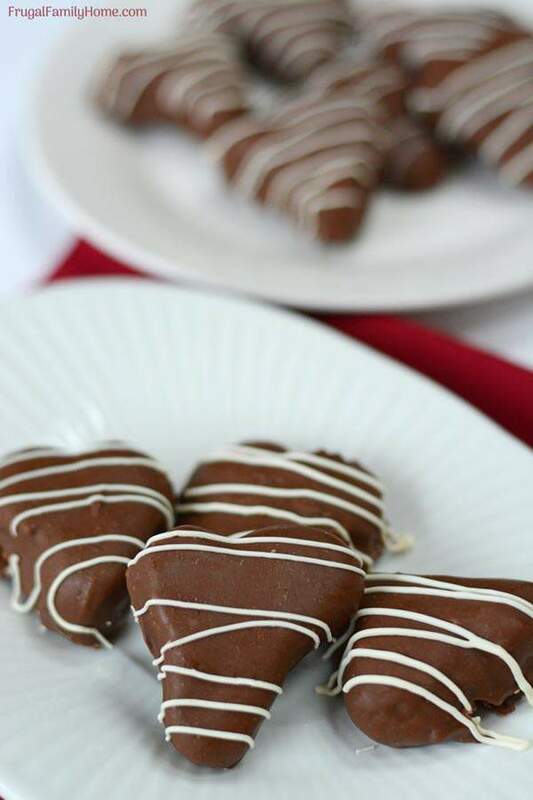 Dip each of the chilled hearts into the chocolate and let the excess chocolate run off. Place on the silicone lined sheet pan and let harden. You can speed up this process by placing them in the refrigerator. Once the chocolate sets, place the vanilla bark into a saucepan and heat over low until melted and smooth. Drizzle the white chocolate over the raspberry cream hearts. Return to the refrigerator to set. After the chocolate has hardened, place the chocolate raspberry cream hearts into a container with a lid and store in the refrigerator. You can freeze them for longer storage. 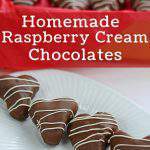 How Much Does it Cost to Make Raspberry Cream Chocolates? I always find it interesting to compare the price of the homemade raspberry cream chocolates with the store bought ones. In case you are wondering too how much you could save by making these at home, here’s the cost comparison. Remember the cost of the store bought cream center chocolates local at $20 per pound. This batch makes over 1 pound of chocolates but we will call it one pound since I didn’t weigh them all before we ate some of them. Which brings the total cost to $4.56 for a little over a pound of homemade chocolate raspberry creams. A savings of $15 a pound. That’s quite a bit of saving over the store bought candy. I’d say definitely worth the time spent making them. When dipping the raspberry creams, you will get a few raspberry cream chocolates that aren’t perfect looking. I know it happens to me often. Some days they turn out looking beautiful other days, not so much. But I have yet to have someone refuse to eat my raspberry cream chocolates because they weren’t pretty enough. If you take the time to make these chocolate raspberry creams yourself, and they don’t turn out perfect. Don’t worry, they will still taste great. These candies look so much fun for Valentine’s Day! I’ve always been intimidated by homemade candy recipes, but you make it look so easy that I’ll have to try these. Thanks for sharing the recipe.